pBuzz is a unique pre-brass instrument made especially for young children. It is the perfect alternative to more traditional first-time instruments such as the recorder. This new instrument has been created and developed by the same team of British musicians that invented the world's first plastic trombone and trumpet. Designed to introduce children to brass instrument playing in a fun engaging way; pBuzz develops skills needed for brass players such as correct embouchure and an ear for correct pitch. 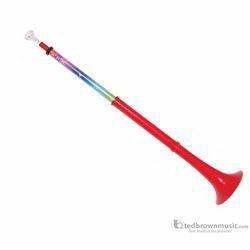 The five inch bell is lightweight and brightly coloured while the inner tube has a coloured insert labelled with different notes. It is the perfect gateway instrument made for young kinds.